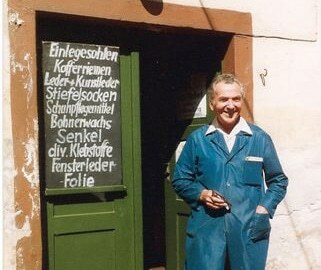 Educated as a merchant in the tannery „Meissner“ near Stolpen, Fritz Pochert founded a leather store in Freital in 1935. He started with the sale of leather for shoe repair works. At this time, there were already 7 local leather stores. After the end of the war, business extended by purchasing raw hides like rabbits, cattle, and sheep. The clients were farmers of surrounding villages. Fritz Pochert was supported by his wife Gertrud, who ran the business alone during the years of war. In 1977, the daughter Carla Gommlich, who had learned by scratch from her father, took over the business. Fritz Pochert transferred the company after 42 years of self-employment. From 1990, business activities were again extended primarily in wholesale. Besides Carla and Wolfgang Gommlich, daughter Cornelia and son André were also working in the company. In the year 2000, son André became co-partner of Pochert OHG and assists his mother in management. On 17th May 2007, the move from Freital to Dresden took place. With the new company building, office and storage space tripled. In January 2010, our webshop for artifical leather and Alcantara „leder-fritz.de“ went online with a new website. With this distribution channel, the sale in this division started throughout Germany. For more than 20 years now, the company Pochert has been active and selling milled material. As a logical and especially customer-orientated development, we have been building up the line Sensopro during the last few years. Here, the experiences in orthopaedic shoe techniques as well as the desire for sophisticated high-quality insoles come together. 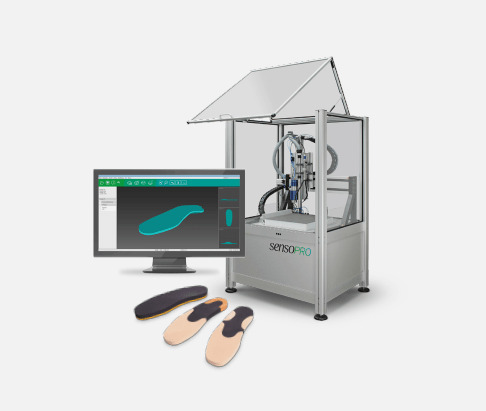 Through our exclusive partner Vamepro, it is now possible to mill extremely thin insoles that fit into tight shoes that are long-lasting and stable at the same time. For the production, a SENSOPRO 4-places milling machine was developed.